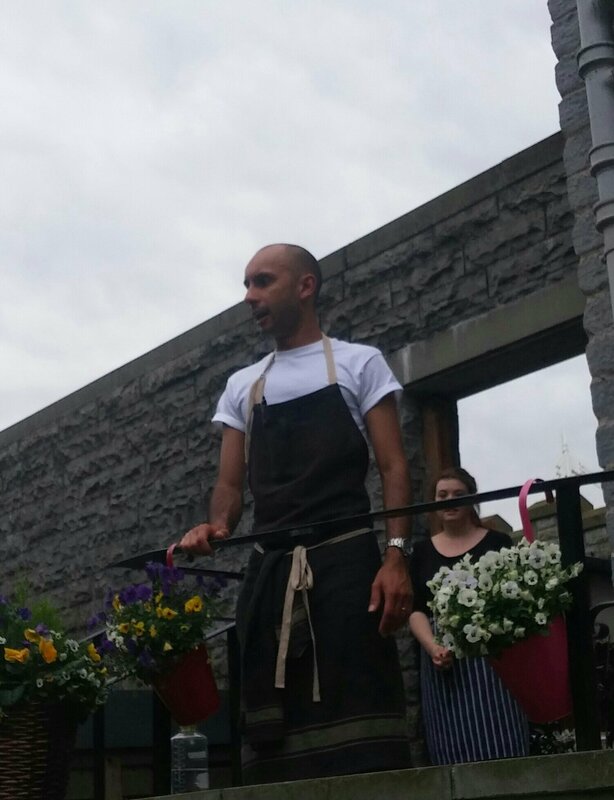 If you live in Cardiff, unless you have been living a hermit like existence under a rock, you will undoubtedly have heard of the exploits of Imran Nathoo, the Cardiff dentist, on Masterchef 2017. A sterling effort, with his stand out offering (in my view) being a vegetarian thalia that wowed Amol Rajan, led to a well fought top ten finish on Masterchef this year. From this beginning, in the real (highly pressurised) world of food, came the promise of further forays into catering for the paying public (pop ups and the like – madness I hear you say bearing in mind he is a dentist and how much they rake in). 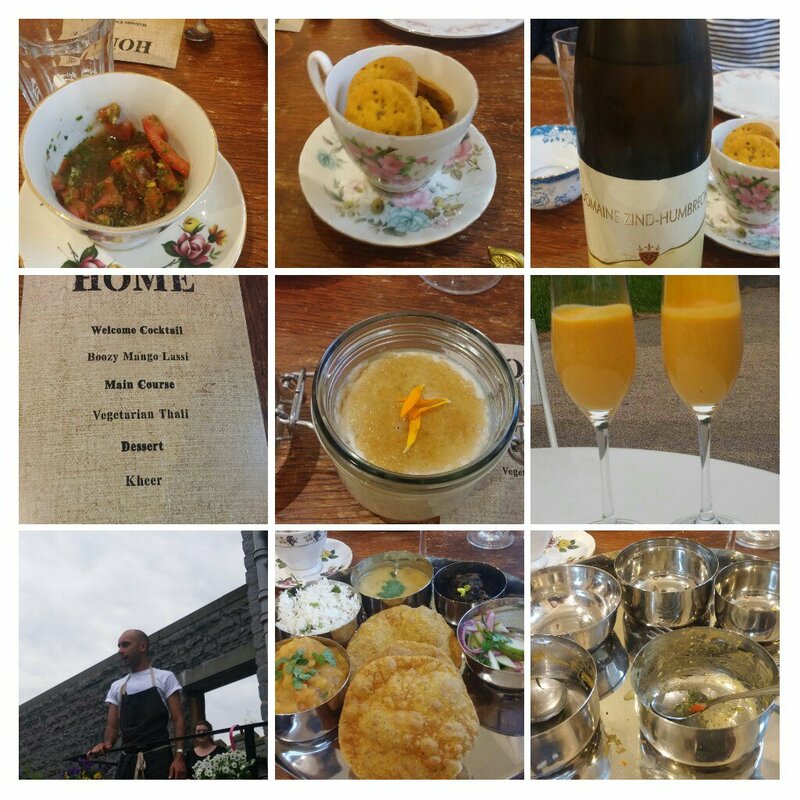 The first such venture (admirably for good causes, with profits going to local Cardiff charities – The Wallich, and The Huggard – and UNICEF) in the form of “Home Supper Club” was a pop up at Pettigrew Tea Rooms in Bute Park. 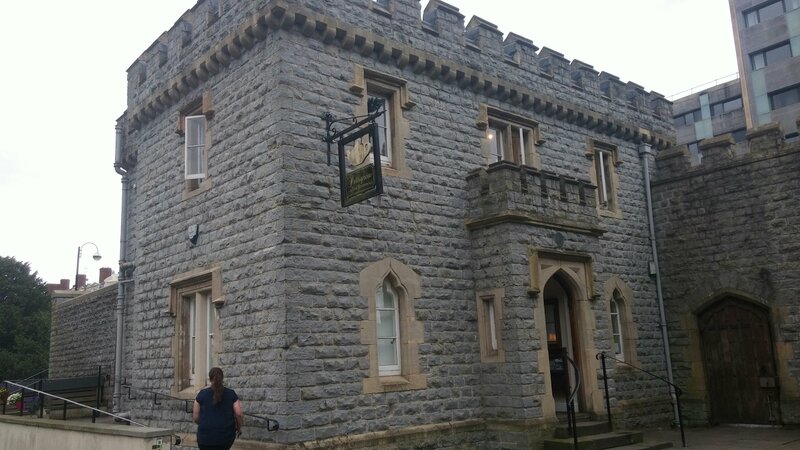 Shamefully this was my sight of the inside of the beautiful building that houses Pettigrew Tea Rooms (I am a frequently visitor to their Victoria Park bakery, but for some reason have not got around to visiting the tea rooms) and I must say it is rather lovely setting both outside and in (must go back for lunch/afternoon tea). With tickets strictly limited (two nights only, with a sitting of 20 per night) it felt like a rather exclusive event and the two communal tables of 10 meant we all interacted rather than retreating into our own personal space bubbles as would perhaps have been the case with tables of 2/4. An idea dictated more by limited space, but one that work well in terms of atmosphere I thought (I would keep it even if the venue changes). 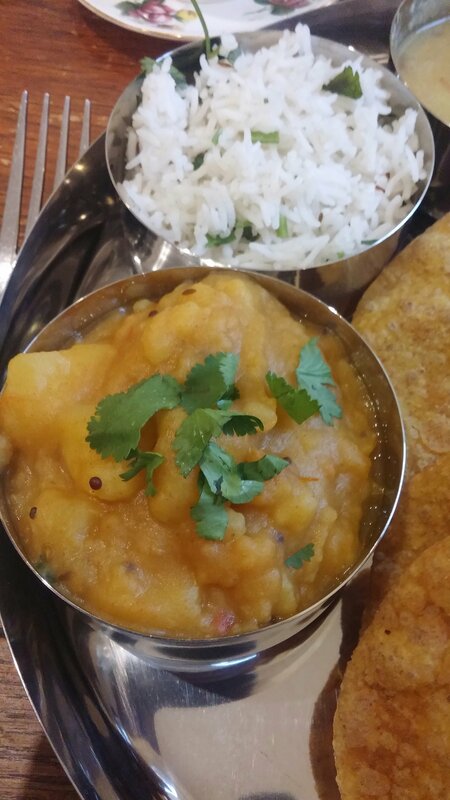 The menu was, very sensibly, a fixed offering based on the most fêted elements of his Masterchef soujour in the form of the vegetarian thali and a equally praised kheer. A rationale move, in my opinion, as over ambition on your first outing in front of the fee paying public (we are all the harshest critics when we are spending are own hard earned dosh) is a recipe for disaster. Better to have on offer something that you are very familar with and stuff where a good proportion of the work is in the advanced prep. Less chance of things (such as timings) going awry (which I am pleased to say they didn’t). 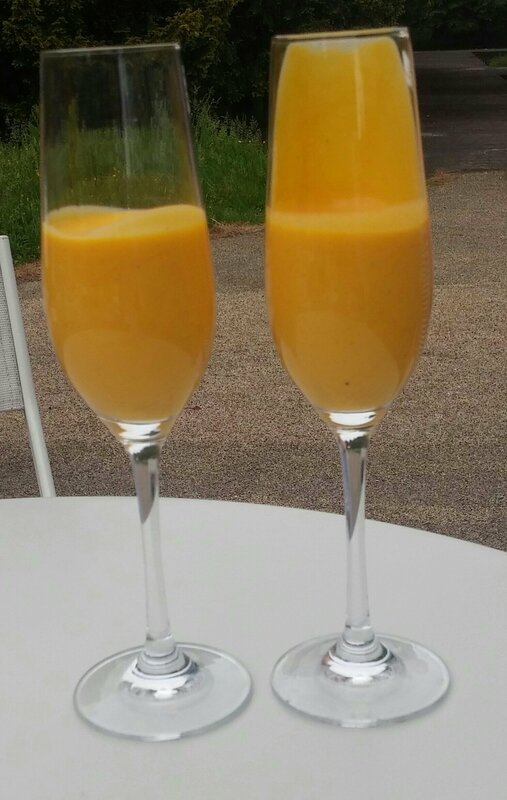 Before the main event thali, proceedings were started off with a boozy mango lassi. Now I am a big fan of the lassi because it is something pleasant to drink when you are not on the booze (designated driver etc.). It is a drink where the fruit does all the talking. 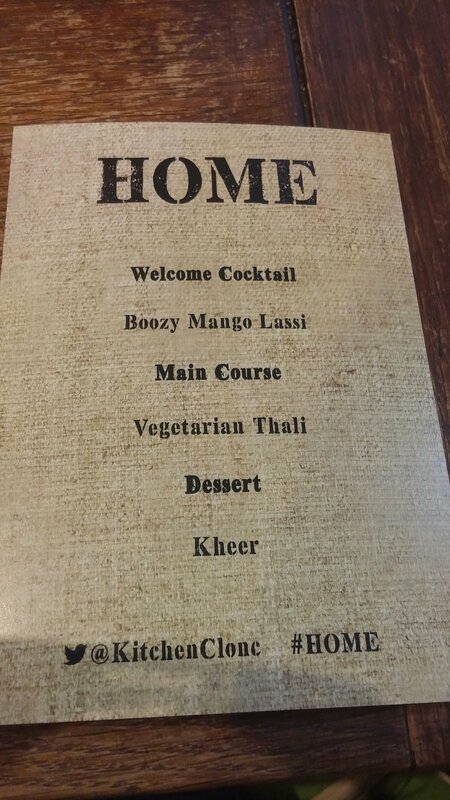 A boozy one is an interesting move as I always think of a lassi as an option when I am not drinking and I would feel bizarrely aggrieved if the booze masked the fruit flavours. Here the booze was rum with a hint of cardamon added to the mix. Some may argue it was a bit light on the booze front, but I thought is was very nice with the level of rum and cardamon enhancing rather than overpowering the all important mango flavour. The use of flutes did make it rather difficult to drink as it was quite thick. Perhaps wider rimmed glasses and straws next time. 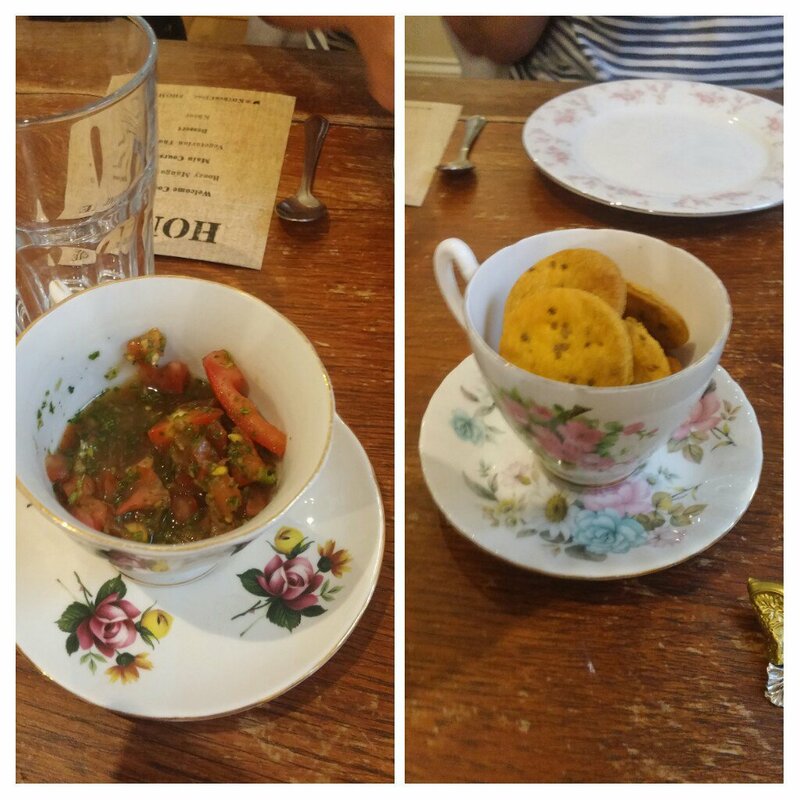 Before we tucked into our thali there was a rather pleasant amusé bouche in the form of some savoury biscuit and a tomato kachumber (in this instance a sort of salsa). Lovely texture to the biscuits (which had a good bit of chilli heat to them). 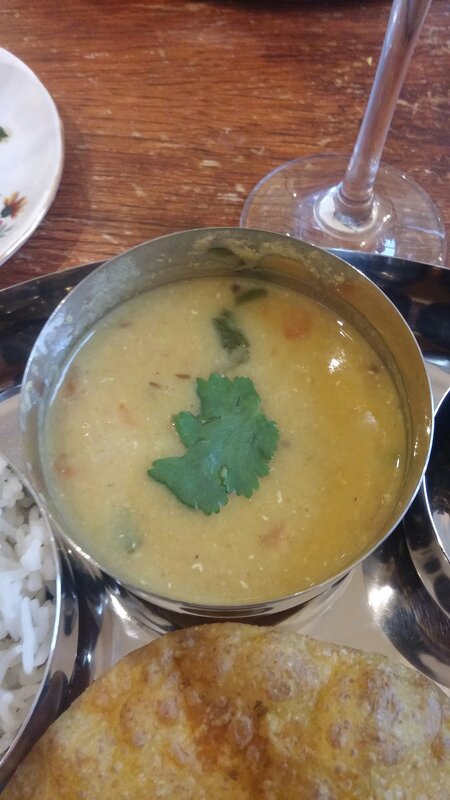 The kachumber was heady with coriander and had a very pleasing fresh acidity to it. A great start to proceeding I thought. On to the main event, the principle behind a thali is to achieve a balance of flavour across the array of taste sensations. So it usually had a combination of dishes that cover salt, sweet, sour, spicy and bitter. I think he hit the proverbial nail on the head with his combinations. Lovely contrasts of flavour and textures that worked really well as against each other. On Masterchef, the dhaal came in for a bit of criticism from Greg Wallace for being too thin. As a point of principle, I disagree with almost everything Wallace says and here (as ever) he is wrong. The consistency of the dhaal was just right for being mopped up by the lovely and light (and again grease free) puris. I am not a fan of dhaal that is the consistency of wallpaper paste and I thought this was just right, with some lovely spicing. As an aside I would love to be on the books of Wallace’s agent, as that person is truly a miracle worker for getting and more amazingly keeping (the always gurning) Wallace on TV. There is still hope for the talentless like me, it seems!!! Apologies for the slightly off piste Wallace bashing (but seriously how is that man still on TV). Anyhow back to the food. The rice (a seemingly easy dish that is seriously easy to bugger up) had been perfectly cooked. Beautifully fluffy, with each grain nicely separated, and most importantly properly seasoned. 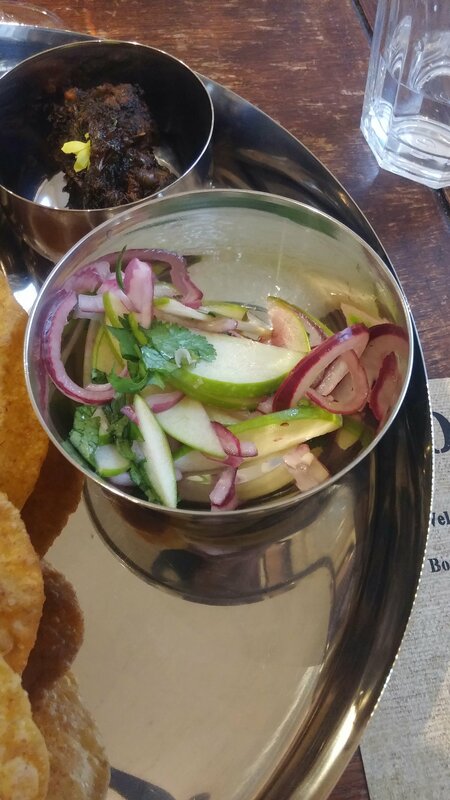 The final element of the thali was an absolutely killer apple and onion kachumber. 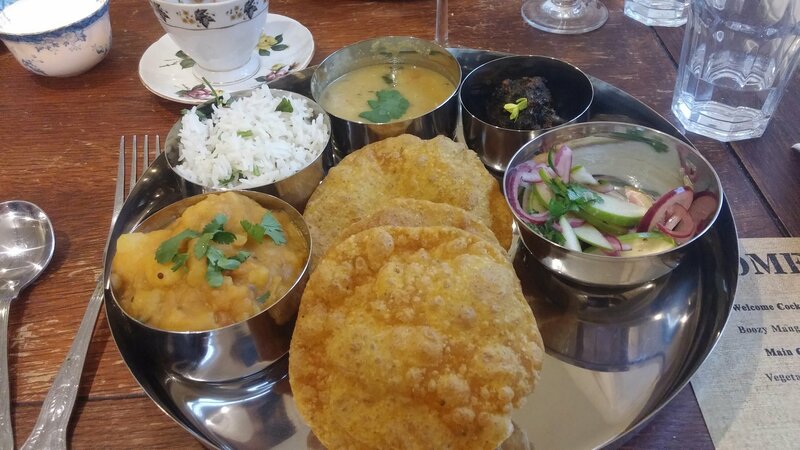 My favourite dish of a really good thali, this had a lovely sour flavour, with heat on the palate at the end. Sharp green apple slices (with a bit of sweetness maybe through a touch of sugar being added), red onions, lime and coriander. Very refreshing, with a great balance of flavours. Bloomingly lovely and the dish of the night for me. 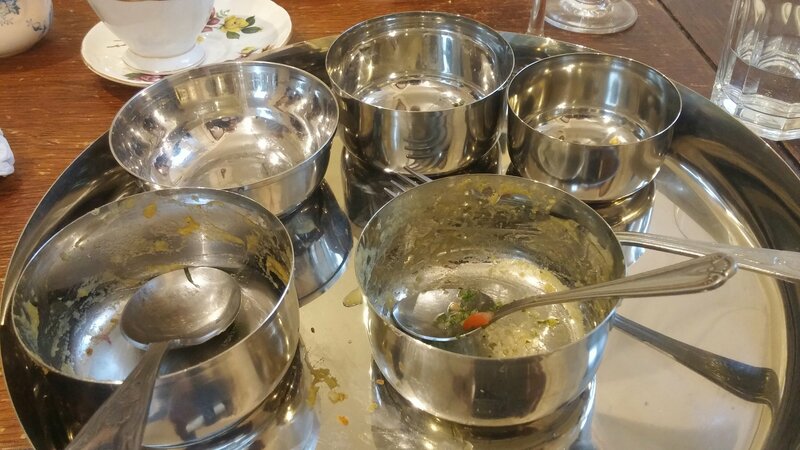 The empty dishes were testimony to how much I enjoyed the thali. 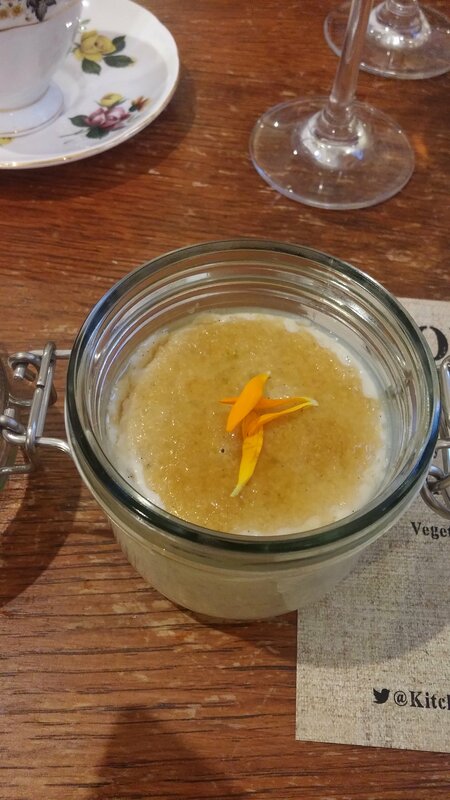 The pudding (kheer) was a cold rice dish with a brulee top. Lovely and creamy (from coconut milk) it had a serious hit of cardamon to it (which I love, but it is a bit of a marmite spice – my friend Rachel loathes it with a passion). My only criticisms of this (and of the whole night really) was the sugar remained crystallised on the top rather than having properly melted and reformed as a sheet as you get with a brulee (bit more blowtorch time required) and the somewhat odd addition of what transpired (after I had eaten it) to be a chive flower (thought it looks like one when saw it, but then thought nah can’t be as I popped it into my gob). The latter was missing from my kheer, perhaps it was meant as a garnish only, but I ate the one Mrs. SF had with her kheer (and I was not the only one to do so). What those of us foolish enough to eat it got was a bit of an unwelcome oniony flavour with our kheer. Perhaps skip it next time or tell people it is not to be eaten (my view on garnishes, in general, is if it is not for eating it shouldn’t be there). Bar from the boozy lassi on arrival, it was a BYO event (corkage at a very reasonable £5.50 per wine bottle), which I always love. Gives me a chance to consider wine pairings with the food on offer. For me the perfect pairing for spice is that most versatile of all grapes, riesling. The question was one from the Old World or a New World number. 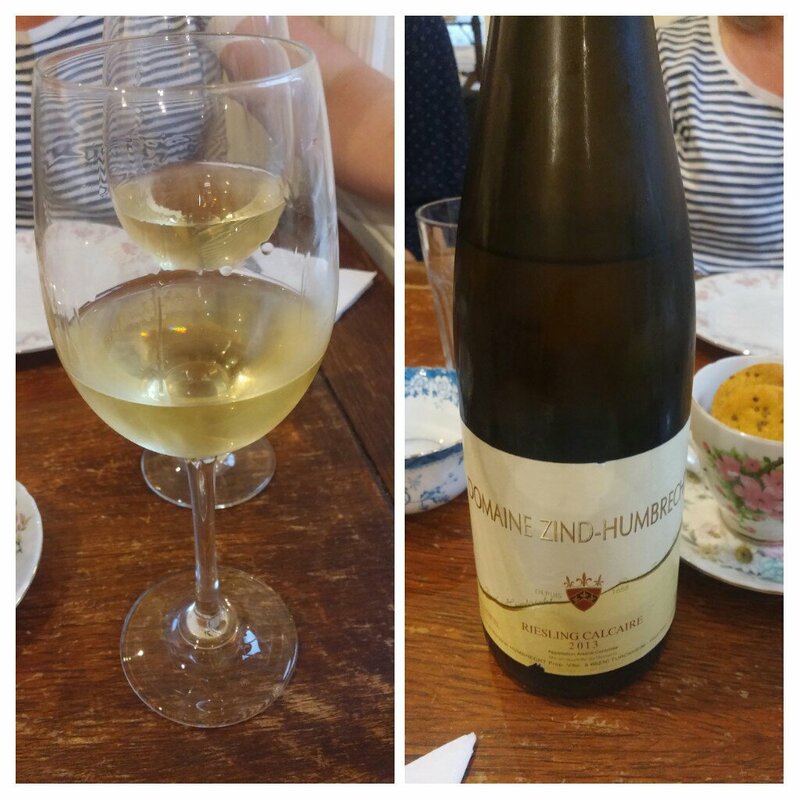 After much deliberation (I am increasingly enamoured with new World rieslings, but my heart remain in the the Old World with the wines of Germany, Alsace and Austria), I went for a classic from the Old World in the form of a Zind Humbecht Riesling Calaire 2013 (picked up at Costco for a bargain price of around £13) from the Alsace (absurdly the only place in France where riesling is grown – only in France could that happen). Lovely minerality to this wine – Calcaire is French for limestone so that makes perfect sense. On the nose, there were aromas you get from wet stone, as well as a lovely herbiness on top of citrus (lemon and a hint of grapefruit). A dry wine it had good crisp acidity (very refreshing) and ripe citrus and herb flavours (lemon verbena and even a touch of basil) on the palate. Really nice now, but will age well I think, it was a great foil for the contrasting flavours of the thali. I was very pleased with myself with this pairing. Cheaper alternatives I would suggest to go with a veggie thali are Aldi’s excellent Clare Valley Riesling (£6.99), Dr L Riesling from Germany (£7.49 in Asda) or a rosé (Aldi again come up trumps value wise with their deservedly highly rated Côté de Provence number at £5.99 ). For a first pop up, I thought it was a great success. Great flavour combinations and he certainly is a dab hand with spicing. The price all in was £25 each (charities got any profits) and we added to that with the £5.50 for corkage we paid and a tip. I was very happy to pay that for a very enjoyable night out. Other events are promised and I would certainly like to try his food against. I would urge people to snap up tickets for the next one. Good food and good causes (a fantastic £700 plus was raised for the nominated charities over the two nights) – can’t really fault it. As it is a pop up no details really, but the next one (according to his instagram and Twitter feeds) is on the 17th June. My advice is check out the twitter feed of @kitchenclonc, as well as his Facebook page and blog. for further details. Tickets on sale now, as I understand it. 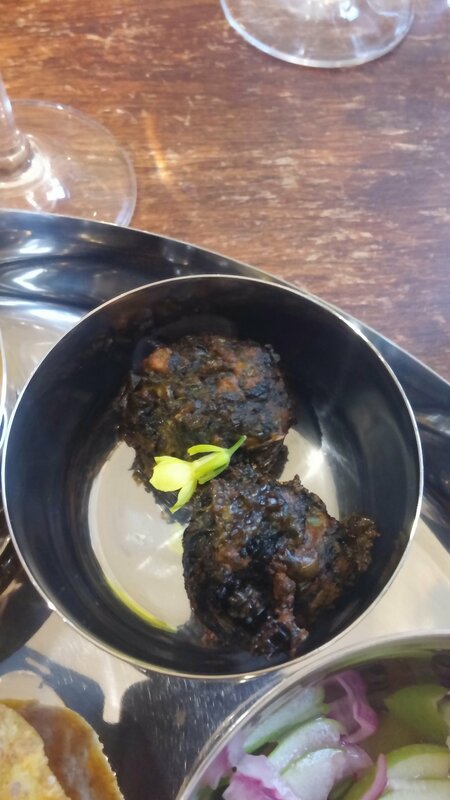 This entry was posted on Jun 4, 2017 by solicitingflavours in Alcoholic drink, BYO, Cardiff, Chilli, corkage, curry, desserts, Drink, Dry white wine, Food, Gujarati food, Indian, Pop up, restaurant review, review, Riesling, salad, vegan, vegetarian food, Wales, White wine, Wine, wine pairing, wine pairings.